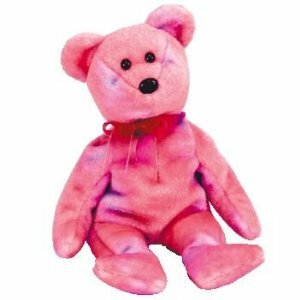 The Clubby 5th Anniversary Edition bear is made from a tie-dyed pink and lilac material with black button eyes and a larger black button nose. She has a purple-pink ribbon fastened around her neck. To thank you for your loyalty! The Clubby 5th Anniversary Edition bear was released on 16th September 2002. Her birthday is on 20th June 2002. The Clubby 5th Anniversary Edition bear could only be bought from the Ty online store and did not come as part of a membership kit.